RaceBets brand is a new addition to the online betting world. You can bet on horse racing around the world (40 countries). Find more about their Welcome bonus in our review. Are you into racing whether it be horse or greyhounds. If you answered yes the RaceBets is the site for you. Not only do they cover racing in the UK they cover meetings in over 40 countries. For all new customers from the United Kingdom they offer a £50 Welcome Bonus*. To receive the Racebets Promo Code just deposit £10 or more and bet through it fully and RaceBets will match it up to £50. *Please note that you will have to wager through your bonus five times before withdrawing any winnings. Read the T&Cs for full details. RaceBets is a new brand and its major focus is on horse and greyhound racing from around the world. They are a recent addition to the industry but they are run by a team of experienced and professional operators. They also have new products that you will not find at any other brand online. RaceBets was established in Germany. Part of the company is owned by German racing. This is similar to BHA in UK. They have their headquarters in Malta this means that they work under the regulations of the Malta Gambling Association. MGA are one of the strictest and competent regulators in the world of online gambling. From the UK Gambling Commission, they obtained a UK license and an Irish license which was obtained from the Irish Regulatory Board. This means that they can take clients that are based in the United Kingdom. Which is good news to visitors of this site. Why Should You Bet At RaceBets? RaceBets cover racing events from over 40 countries. They cover all the horse racing and greyhound racing in the UK. Some of the other countries that they cover racing for France, South Africa, Italy, Sweden, New Zealand, Chile and Morocco to name a few. Their business model is to offer great services and to lead their competitors in offering a first class service. 2015 saw them set a record when they offered 266,534 races. With The wide variety of countries they cover. It is no wonder that they offer the largest number of Ante-Post races which you will find at any of the online bookmakers. They cover all the big races around the world, for instance The Derby, Gold Cup, Lincoln. The prices for these big races almost always go up earlier than any other bookmakers ante post markets. For the promotions, they are very competitive. Their promos are available to UK & Irish races. Some of the promos are on refunds to the first fence faller and beaten by a nose bonus. They provide unique bonuses for the big races which can be in form of money back and enhanced places. 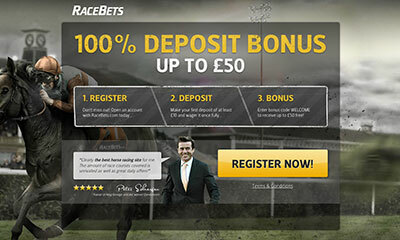 When you first sign up with them using the link on this page, you can enjoy a welcome bonus of up to £50 which is given in the form of a match up bonus on your first deposit when you register with RaceBets Promo Code. Wager your first deposit then use the bonus code to have your matched bonus credited into your account. Please read the Terms & Conditions carefully. The main one about your welcome bonus is that the bonus must be wagered through 5x*. RaceBets offer some great money back specials with our RaceBets Promo Code. Because they concentrate on horse racing they can offer promotions like. If your horse falls at the first fence, if your horse for some reason takes the wrong course. It’s frustrating when your horse is beaten by a nose or refuses to race, do not to worry – RaceBets will give you you money back**. **Day of the race market only. Single win fixed odds bets only. Beaten by a nose applies to the official distance between first and second place only. Maximum refund applied is £/€25. Bonus will be credited within 24 hours. Refund is credited as bonus cash. Bonus must be wagered 3 times . One refund per customer, per race, first bet placed on the market will count. Bets placed with a free bet or bonus cash do not qualify for this promotion. Standard terms and conditions apply. RaceBets decision is final. Only available to UK & Irish customers. Only avaliable in UK, Ireland, UAE markets. Any withdrawal can be made by hovering over you account name and selecting Withdrawal Funds. Winnings can then be withdrawn to the card or payment method you have chosen to deposit. If you experience any issues with you betting or anything else, you can count on the customer support team that is available 24/7 to assist you in sorting your problem. With this kind of assistance, you will be guaranteed of a stress free and uninterrupted betting session. The RaceBets website is innovative and user friendly. You will love it as it is only dedicated to racing alone. This is evident with the impressive, simply organized and laid out website. You will love the fast navigation which makes betting easy and fast. The site is fast and ranks among the fastest loading websites.